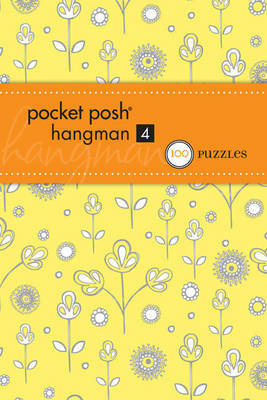 Pocket Posh ® Hangman 4 features a chicly styled cover making it a smart, sophisticated accessory that goes with anything. Packaged in a handy size, Pocket Posh ® Hangman 4 fits nicely into a purse or bag. Pocket Posh ® Hangman 4 contains 100 classic hangman puzzles with an irresistible scratch-off feature. Fun word list includes persons, places, or things that interest women, such as: art gallery, Italian villa, Gwyneth Paltrow, Hermes handbag, and much, much more. With more than 3 million copies in print, the Pocket Posh ® puzzle series is a great way to exercise your mind-and look great while doing it!